When worlds collide; it’s a JustUs Geeks Exclusive from Mikey Burgett! I am a huge Star Wars fan. I grew up watching the original trilogy over and over on VHS, saw the Special Edition in theaters, read the novels, and collected lots of merchandise (including action figures and pretty much anything Star Wars). I have a copy of A New Hope on Videodisc (predecessor to VHS & Laserdisc), the original trilogy on VHS, DVD & Blu-Ray and can pretty much quote any scene (I can’t as much with the prequels but I appreciate them for what they are). Star Wars is the franchise that I “geeked” out the most growing up (and in many ways still do today). Though I enjoyed a lot of other franchises, the go-to franchise for me has been Star Wars. Recently (as in this past winter), I began to get into another pretty popular franchise within the geek community: Doctor Who. Growing up I barely knew anything about Doctor Who (mainly because I was a child when the show was finishing up its run and I didn’t watch it on PBS…don’t even remember if the local PBS even showed it). The recent revival of the show has made it popular again and a lot of my friends were talking about it so I thought I’d check it out. Now most people have started with the start of the revival (2005) but not me. No, I decided I would start way at the beginning…1963. Yes, it’s a daunting task to try and go through now 50 years of a TV series but I wanted to understand the history and go through the storyline. With thanks to Netflix (DVD & Instant Streaming), it is possible to watch a majority of the stories, covering the span of all the doctors (and as of the writing of this article, I’m to Season 15 aka stories from 1977-78). The more I got into watching Doctor Who episodes, the more I found plenty of connections to the Star Wars saga. However, if one knows their history, then it should not be too much of a surprise that there are connections. It has been cool to see and to find them out. For those who do not know, the original trilogy filmed at Elstree Studios, which is located in London. Most of the studio work was done there. Therefore, when casting was done for those films, there were plenty of British actors that were hired for supporting roles (and even some starring roles). Many of these actors have starred in many British TV shows including Doctor Who, which was one of the top programs on the BBC in the 60’s, 70’s & 80’s. Wonder who has performed on Doctor Who and Star Wars? Here are several examples. David Prowse, best known as the man under the mask of Darth Vader, also played the role of the Minotaur in the 1972 serial “The Time Monster”. Jeremy Bulloch, who played Boba Fett in The Empire Strikes Back and Return of the Jedi, played in two Doctor Who serials 1965’s “The Space Museum” & 1973/74’s “The Time Warrior”. Garrick Hagon, who was Biggs Darklighter in A New Hope, was in the 1972 serial “The Mutants”. Also, Michael Sheard, known for his role as Admiral Ozzel in The Empire Strikes Back, had a role in six Doctor Who serials. They were 1966’s “The Ark”, 1971’s “The Mind of Evil”, 1975’s “Pyramids of Mars”, 1977’s “The Invisible Enemy”, 1982’s “Castrovalva” & 1988’s “Remembrance of the Daleks”. Probably two of the most famous actors who have connections to Doctor Who & Star Wars are Peter Cushing and Julian Glover. Cushing, who played Grand Moff Tarkin in A New Hope, was actually the Doctor himself…in two feature films featuring the Daleks: Dr. Who and the Daleks in 1965 and Daleks’ Invasion Earth: 2150 A.D. in 1966 (yes, these two films are not necessarily canon with the TV series but still interesting). Julian Glover, who played General Veers in The Empire Strikes Back (and also was the main villain in Indiana Jones and the Last Crusade), was in two Doctor Who serials 1965’s “The Crusade” and 1979’s “City of Death”. 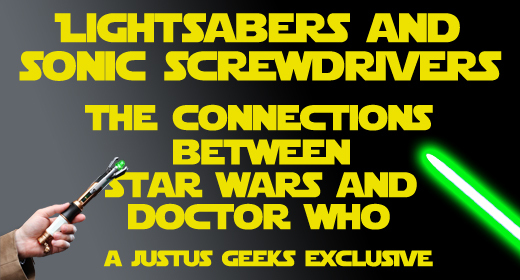 There are also connections regarding the revived Doctor Who and Star Wars as well. One of the major ones is the Tenth Doctor, David Tennant. Tennant also voiced the character Huyang in the Star Wars: The Clone Wars animated series. These are just a few examples of the connections between Star Wars and Doctor Who. There are more that you should check out for yourself. It is like little easter eggs when watching both franchises. It just goes to show you a long time ago and a galaxy far, far away isn’t a problem for a TARDIS. Comic Review Friday: Morning Glories Issue 30!